And mango. And avocado. And queso. And a quick little pico. And did I mention a creamy, cheesy melty queso? Soooo much rooms for toppings. So much room for activities. Ugh. I fried homemade tortilla chips. They are the best thing of life. The good news? You totally don’t need to deep fry them! I used Elise’s method and put a bit of oil in my cast iron skillet once it was screaming hot. I also used a combo of flour and corn tortillas because 1. that’s what I had on hand and 2. we are the most indecisive tortilla family ever. It’s suuuper simple. Once that oil is hot, you just throw the tortillas in and flip and twist until crispy. Like maybe three minutes tops, if even. I tore my tortillas into rustic-y pieces because this one time, I ate Mexican food with Bev and the tortillas were torn and fried and so light and crispy that it’s been two years and I’m STILL thinking about them. I wanted to recreate that whole rustic thing, so I tore mine. Fun. Can we talk about the crispy-ish pork? I know, I’m doing a lot of hyphens today. Hyphenating all the things like the annoying millennial that I am. All you English majors would like me to take a long walk off a short pier, no? Anyhoo – the pork. I seared it quickly and threw it in the crock pot. Let it get pull-apart tender and THEN – I shredded it and threw it in the baking dish and roasted it for a bit. You have those crispy edges of pulled pork and pieces that straight up melt in your mouth. The roasting thing isn’t necessary but if you have some extra time (…HA!) and want that authentic-y taco truck feel, I say go for it. If not, roast it from the get go. Oh. Oh oh oh oh oh. And the queso. EEEEEEP. It’s just a quick queso that I’ve made before on the blog for other recipes, but it’s creamy wonderfulness MAKES the nachos. 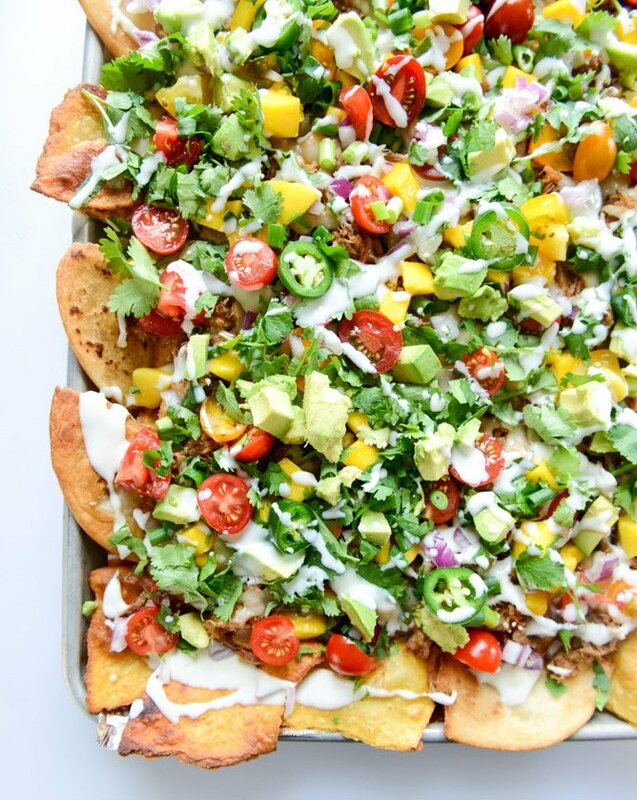 Well, wait – here’s what makes the nachos: two cheeses. The creamy queso AND the extra grated cheese. I firmly believe that for ideal nachos, you need both. You get it? Look at this! We’re eating the rainbow! This is so healthy I can’t even stand myself. See? Doesn’t that white cheese look like the picture of health? I know. I need you to tell me your exact Cinco de Mayo menu down there in the comments. I pinned approximately four million recipes last night. Like what kind of margarita are you making? Please tell me either strawberry or peach or ginger beer or kiwi? Or maybe even kiwi strawberry?! Margarita mashup! It’s pretty much mandatory that you make this pineapple goat cheese guacamole. I’m debating on these old school crispy shrimp tacos or these ginger garlic steak tacos with pineapple pico. Orrrr these beer battered fish tacos. Or wait! Enchiladas! What the heck. Why must I forget about them? These spicy beer braised lime chicken enchiladas are winners. So are the lightened up beef enchis with 10-minute enchilada sauce! If you really want to trash things up, you can make BBQ chicken enchis or buffalo chicken enchis, two ridiculously old and popular recipes from the site. I promise to never say enchis again. This just-like chipotle’s corn salsa is soooo copycat-ish. Make it and put it on everything. I do think you should start with breakfast tacos, because that’s the way life should be. 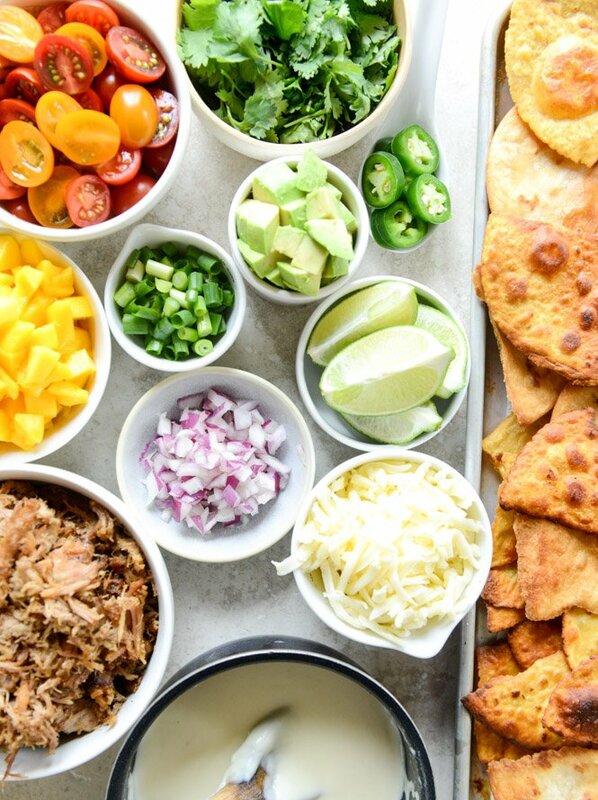 Oh and if you have absolutely zero time for dinner (translation: like only 30 minutes) you should make these 20 minute turkey taco nachos! Otherwise… eat all the queso. You can easily make the pork ahead of time! Heat a large skillet over medium-high heat and add the canola oil. Add the pork and sear on all sides until golden, about 2 minutes per side. Place the pork in the crockpot with the beer and add the salt, pepper and spices. Cook on low for 12 hours or high for 6 to 8 hours. Once finished, the pork should shred easily with a fork. Before serving the pork, I like to crisp it up in the oven. To do this, I spread the shredded pork in a large baking dish. Preheat the oven to 400 degrees F. Place the baking dish in the oven and roast for 30 minutes, tossing the pork with a fork every 10 minutes. You don’t HAVE to do this step, but it really makes it taste like authentic carnitas. Heat a cast iron skillet over medium-high heat and add the canola oil. Add the tortilla pieces in batches (however many your skillet can hold in a single layer) and fry until golden brown, about 2 to 3 minutes. Remove and place on a paper towel to drain excess grease. Sprinkle the chips with salt and repeat until your tortillas are gone. 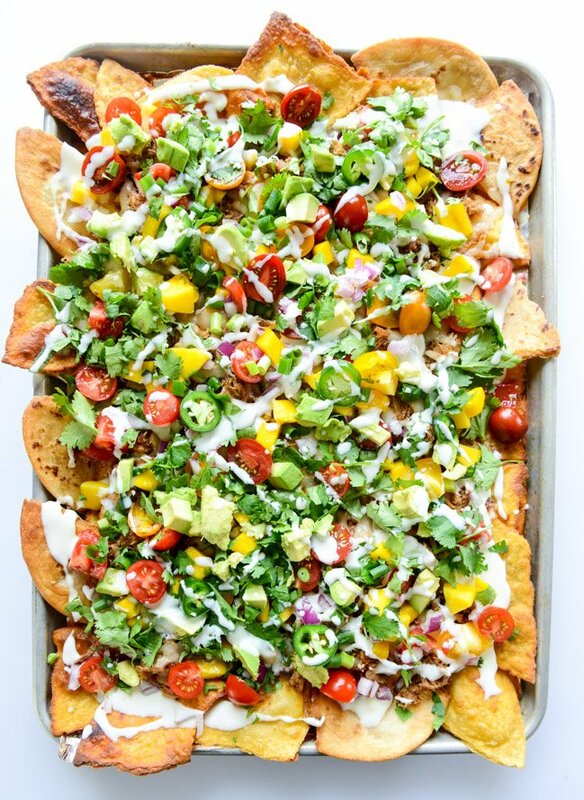 To assemble the nachos, lay the chips in a layer on a large baking sheet (I like to cover mine with foil first). Sprinkle on the grated cheese then add on the pork. Drizzle on half of the queso. Place the nachos in the oven and cook until heated through and the cheese is melted. 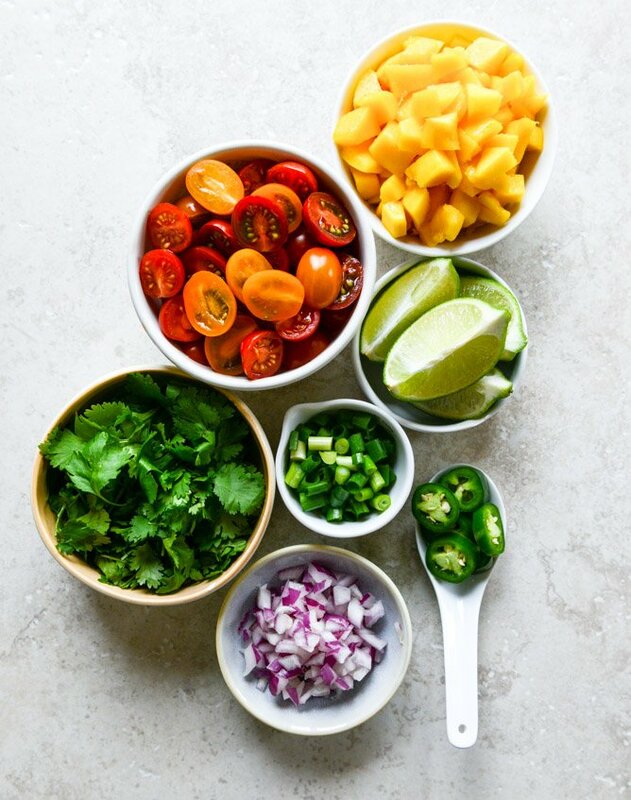 Remove the nachos and cover with the scallions, peppers, avocado, cilantro, mango, tomatoes and red onion. Drizzle more queso on to before serving! swan diving into that pile. These look AMAZING! I need them!!!! 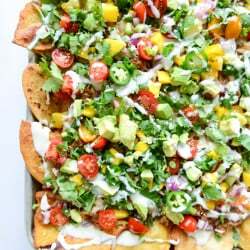 We made these nachos tonight. While they took a long time and the queso took three time to perfect, they were absolutely worth it. DELICIOUS! We put the onions, scallions, and jalapenos on before putting the nachos in the oven. I made these tonight and they were fantastic!! I love all of your Mexican recipes. The queso the recipe lists 1/3 cup of milk– I wonder if that’s an error? I needed to add at least a full cup to make it the consistency of a sauce. Thank you for all of the fabulous meals!!! Hello, this looks amazing! I was wondering if you used bone in or boneless pork. does it make a difference? Making these right now – can’t wait – recipe looks amazing. I made this about a month ago – just amazing. The flavor. The texture. All there. I now want super badly, but it’s after 6p and have no pork, mangoes, or peppers…..oh, the woes of being hungry, pregnant, and indecisive. Brilliant recipe and taste. I really tastes such a solution and do it often. Theoretically, these chips can fry or bake – I always choose baked, I think they are then tastier and healthier.